When trying to describe where Blackfen is, I have usually resorted to approximations such as "the border between South-East London and Kent" and "just inside the M25 near the Dartford Tunnel" or occasionally "quite near Greenwich." However, I think that I will have to change all that - from now on it will be "Westminster Cathedral? Oh, it's quite near Blackfen..."
Blackfen is quite the up-and-coming travel destination, it seems... at least, it is if you are a Brazilian seminarian at the Institut du Bon Pasteur, France, and you want to attend the Traditional Latin Mass on a Sunday! 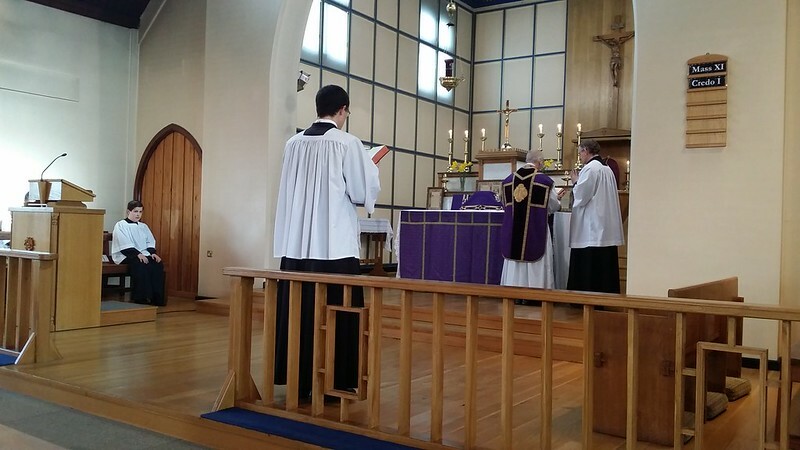 One of the seminarians is an avid blog-reader, and has been following His Hermeneuticalness from well before he entered seminary. 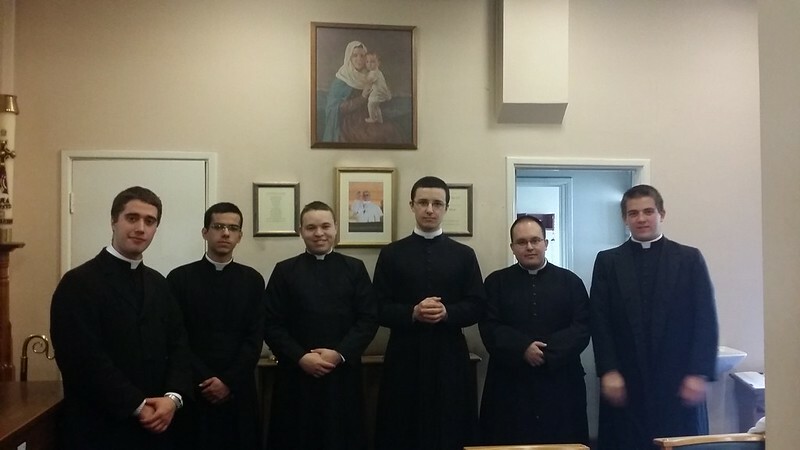 Six seminarians came to visit on Quinquagesima Sunday. 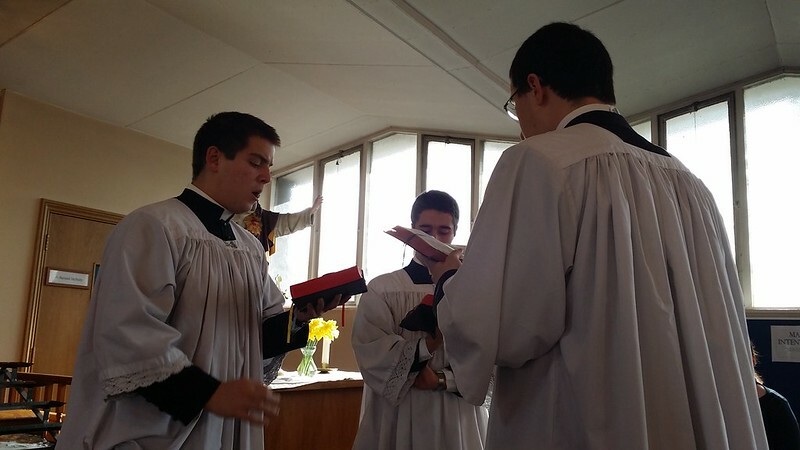 Three of them joined the choir and sang the propers and a couple of other pieces at the Offertory and at Communion. The other three served on the Sanctuary. They were lovely chaps, and told us that their seminary is at a bit of a crisis point, as they have 33 seminarians and five priests, but have only got 28 rooms in two houses. Prayers would be very much appreciated. I'm afraid that my vanity was given full rein: "Ahhh! So you're Mulier Fortis...!" The three readers of this blog who appear to be ailurophobic can breathe a sigh of relief - I think that the number of kitty-related posts will return to pre-Miaowrini's-accident frequency. To be fair, I haven't posted anything about cats for a whole month... not since the post on my last visit to the vet. Anyway, it's time for an update. 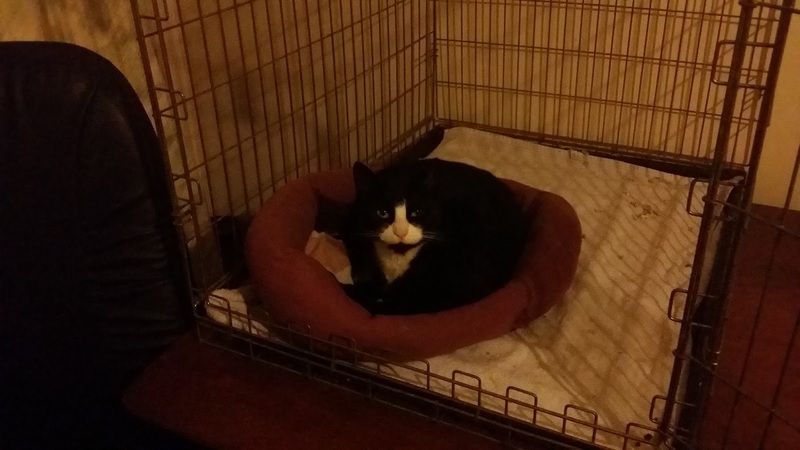 I had started to let Miaowrini spend the day wandering around the sitting room during the day, and then putting her back in the cage at night. 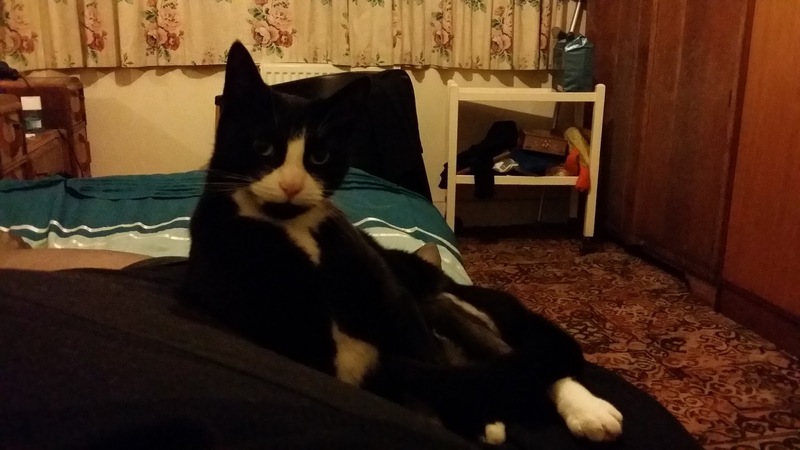 That seemed to go well, and then, after my return from Ampleforth, I went a step further, and allowed her to roam around the flat for a few hours when I got home. Letting her stay out and about all night was the next big thing. On the first night she managed to get up to the top of the wardrobe... and then couldn't get down. I managed to manoeuvre the suitcase down (with her on top) and so disaster was averted. 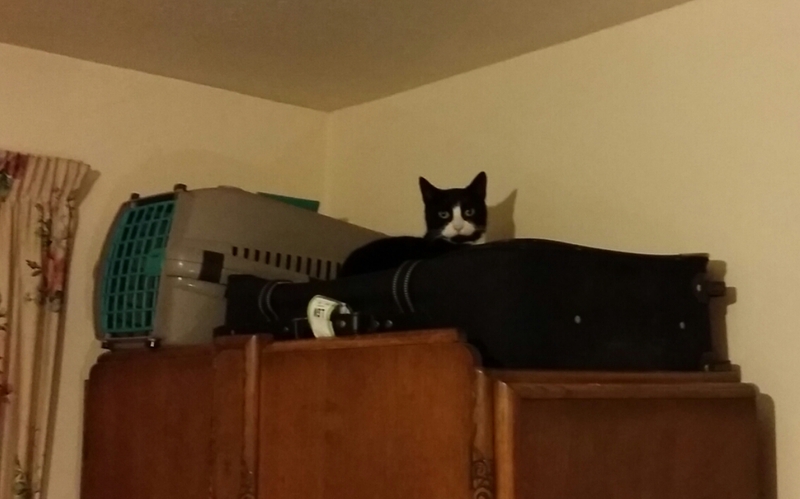 The second night, Furretti had bagged the spot on top of the wardrobe, and was repelling all boarders. Miaowrini retired, in a huff. The silence which followed was so profound that I became nervous, and went in search of her. I found her, curled up in the cage, which quite brought a lump to my throat! The third night was rather chilly. Miaowrini promptly rediscovered the delights of sleeping on my bed. This evening I took Miaowrini to the vet for a further check-up. The vet examined her carefully, and then nearly gave me a heart attack when he told me that her knee was swollen. Just as I was berating myself for being irresponsible in letting the cat out of the cage, the vet then told me that this swelling was totally normal, and that the cat would possibly be prone to arthritis in later years. He declared himself delighted with her progress (as well as being pretty amazed by it) though he added that he sincerely hoped that he never came across such a severe injury ever again. Nevertheless, a little celebration was in order. The two cages I borrowed from Annie Elizabeth were both duly dismantled (a task which was reminiscent of the puzzle challenge on the Krypton Factor - putting the cages up seemed much easier). And tonight Miaowrini and Furretti are both curled up on my bed, fast asleep.